Amana branded ovens are manufactured for residential use. 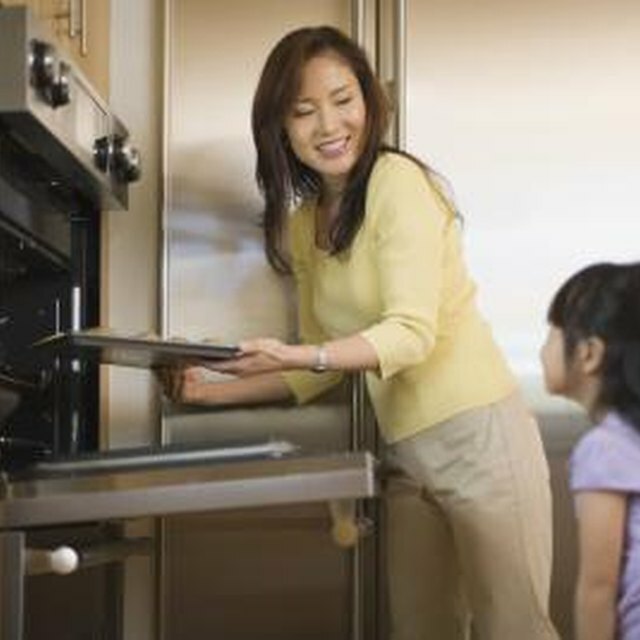 The oven compartment contains a bake element on the floor of the oven and a broil element mounted to the ceiling of the oven. These elements conduct electricity and glow during use which generates heat inside the oven compartment with which to cook food. Either element can break down over time and cease to function as expected. Purchase new elements from an appliance parts retailer and install it with a screwdriver. Disconnect power to the oven. Allow the oven to cool completely. Open the oven door. Remove the oven racks. Set the racks aside. Remove two screws holding the bake element to the rear wall of the oven compartment. Pull the element forward until the rear legs on the element clear the rear wall and expose the wires. Grasp the wire connectors on each leg of the element. Pull the wires off the terminals with gentle firmness. Remove the bake element from the oven. Reverse the steps to install the new bake element. Remove two screws holding the broil element to the rear wall of the oven compartment. Remove two screws holding the broil element to the front mount bracket hanging from the ceiling of the oven compartment. Pull the element forward until the rear legs on the element clear the rear wall and expose the wires. Grasp the wire connectors on each leg of the element. Pull the wires off the terminals with gentle firmness. Remove the broil element from the oven. Reverse the steps to install the new broil element.